JERUSALEM, ISRAEL–I don’t really think the readers of this blog have been anxiously waiting to hear the taxonomic identification of the ammonite I found in the Matmor Formation last week. It is worth a note, though, to briefly describe how I now know the beauty is Peltoceras solidum. Yoav and I traveled today to Jerusalem to work in the offices of the Geological Survey of Israel. While there I was able to examine the ammonite collections of Ze’ev Lewy, a retired paleontologist with the Survey. He collected the specimen pictured below from the Matmor several years ago. Dead ringer for my paltry fragments, which show the same external ornamentation and the same internal suture pattern. Case solved! 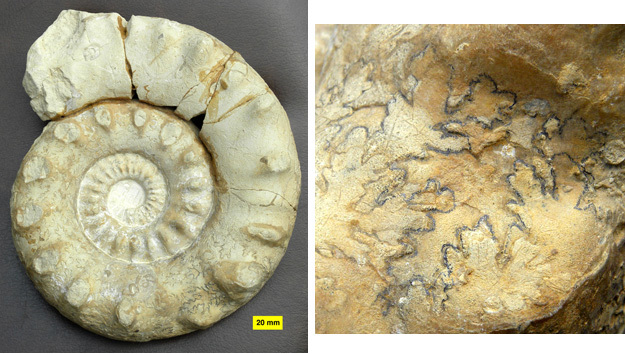 Ammonite found in the Matmor Formation at Makhtesh Gadol by Ze'ev Lewy of the Geological Survey of Israel. The close-up on the right is of the suture pattern highlighted with a pencil.